Daycare and preschool age children can safely explore new heights on the SoftZone Tiny Twisting Foam Climber from ECR4Kids, a beginner climber with a spiral staircase, platform for relaxing, and a slide. Offering a fun and captivating selection of shapes and bright colors, this SoftZone play structure encourages movement and muscle action that help to develop gross motor skills as well as social interaction. 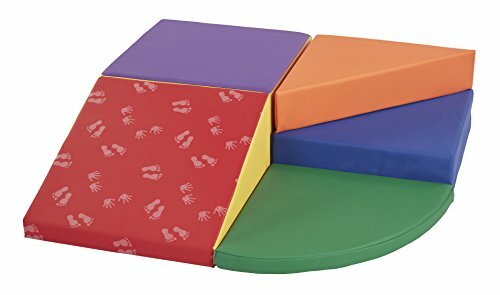 The SoftZone Tiny Twisting Foam Climber is constructed of higher-density polyurethane foam to keep children safe while they explore, and it's covered with reinforced, phthalate-free vinyl in bright primary and secondary colors that's easy to wipe clean. ECR4Kids SoftZone play structures have achieved GREENGUARD [GOLD} Certification for meeting or exceeding standards for low emissions into indoor air during product usage. They are also CPSIA-compliant for safety, and adhere to CA-117 requirements for fire retardancy. With a concentration on the Pre K-12 sector, ECR4Kids offers a wide range of products from tables, chairs and desks to cots, mats and a variety of storage cases in solid wood as well as scratch resistant double-sided laminate.